EZSignIt is a FREE digital code signing program that allows you to easily and quickly digitally sign one or more files using a code-signing ( authenticode ) certificate that you possess. It can sign multiple files at 1 time, remembers your last used settings, and unlike many other solutions, is NOT dependent on any other MS tools! You can use the GUI or you can digitally sign via the command line. EZSignIt only works with the newer .PFX or .P12 digital signature format, but you can easily convert your SPC/PVK files into this format using the supplied instructions. Code signing has never been easier. No installation is required to use this tool. EZSignIt Portable is a handy piece of software that enables you to code-sign your applications and hence, attest their authenticity and integrity, without too much hassle. The program comes with a bare-bones and simplistic interface that consists of a medium-size window that features most functions and features. Within the main window, you can specify the application or file that you want to protect, the certificate and then hit the corresponding button to digitally sign the code or file. You will be happy to learn that the program enables you to sign multiple files at once. As it is suggested within the application, you can add the files individually, save it as a filelist that takes into account all the settings you selected and proceed to batch code-signing the files to validate them for your loyal customers. You should now that the application includes several signature algorithms, including SHA-265, SHA-384 and SHA-512, for example. You should keep in mind that certain algorithms may not work for all operating systems. Therefore, if you plan to release apps for Vista or XP, then it would be safer to opt for the Dual-Sign SHA-1 & SHA-256. While the utility comes with a built-in signer, you can also use CAPICOM or SignTool to add authenticity to your files. On a side note, you should know that CAPICOM can only be accessed from the command-line and it is limited to the SHA-1 signing algorithm. More often than not, the fastest method to determine whether the application you just download is safe or not entails verifying the author or publisher's identity. 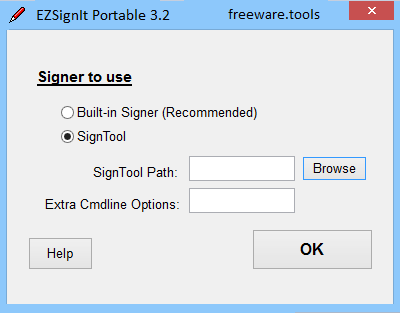 Therefore, if you want to ensure your customers that they are about to install a software solution designed by you, then EZSignIt Portable enables you to sign it easily.